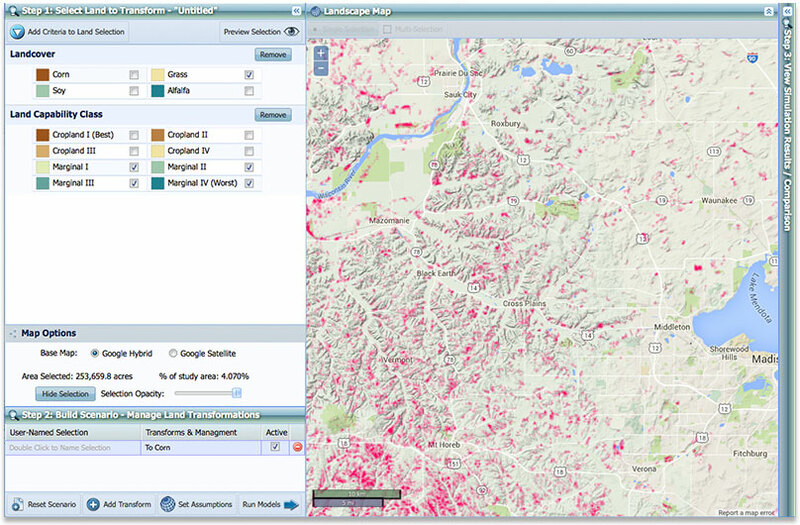 The SmartScape™ DSS (SDSS) software allows users to build and evaluate land-use change scenarios. The SDSS integrates a variety of open-source tools (ExtJS, OpenLayers, GeoExt, Geoserver, Play! Framework) to build a user-friendly web application. Users use a browser-based client to select different places on the landscape using a simple query tool, and enact transformations on selected land, such as converting row-crop agriculture into grasslands. Then users launch a battery of pre-programmed models on the computation server that calculate economic and environmental outcomes of that land use change. Outcomes are returned to the user’s browser to visualize the environmental and economic outcomes of the land-use transformations. Scenarios can be evaluated within seconds, greatly enhancing the stakeholder’s decision-making processes. Go to the Wisconsin Energy Institute page for full access.